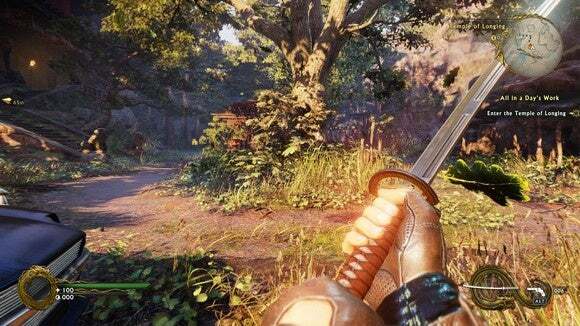 Shadow Warrior 2 is the first traditional PC game to include Nvidia's multi-resolution shading technology, and it's a game changer. Lo Wang is back, baby. 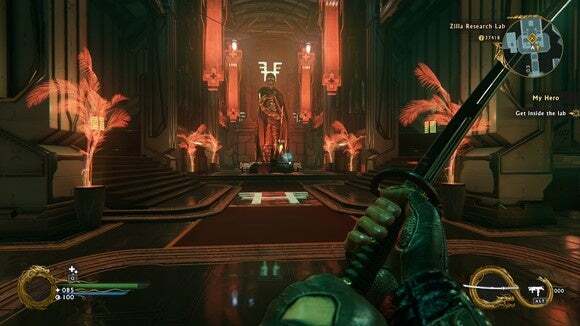 Shadow Warrior 2 ($40 on Steam) launched today and while its procedurally generated levels give the game a bit less bite than its predecessor, it’s still a riotously good time in a satisfying “mindlessly killing demons” sort of way. 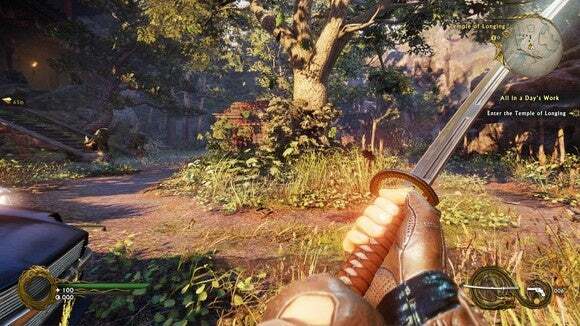 But we covered all that in PCWorld’s Shadow Warrior 2 review. This article’s dedicated to a pair of Shadow Warrior 2’s PC “firsts” that are almost more exciting for enthusiasts than the game itself: HDR and Nvidia’s multi-resolution shading, and more particularly the latter. HDR’s straightforward enough. 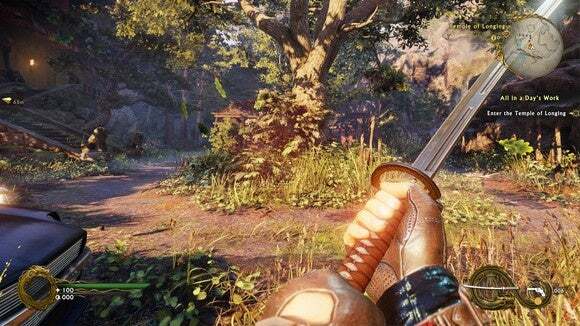 Shadow Warrior 2 is the first PC game to ship with high-dynamic range support, a feature that can drastically improve the color, lighting, and brightness of a scene. You’ll need a modern graphics card with HDMI 2.0 to support it, along with an HDR-capable TV, as no HDR monitors have trickled onto the market yet. But if you can make the hardware stars align, HDR is nothing short of glorious—to my eye, the leap from a non-HDR screen to an HDR screen provides a visual upgrade far exceeding the boost from 1080p to 4K. Got it? Good. Now onto the truly interesting stuff. 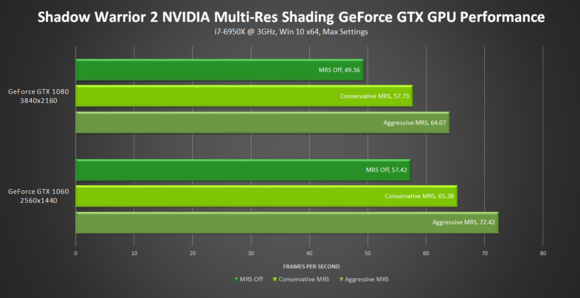 Nvidia’s multi-resolution shading (MRS) has the potential to be a game changer. I’ve been saying it ever since I first witnessed MRS as part of a virtual reality tech demo, and I sang the same song after trying Obduction with MRS enabled when the technology was absorbed into the GeForce GTX 10-series’ simultaneous multi-projection feature. Now that it’s live and in action in a traditional PC game, that potential is becoming reality. Multi-res shading delivers significant performance improvements. Nvidia’s technology was built for VR but adapts well to standard games. MRS divides the screen into several quadrants. 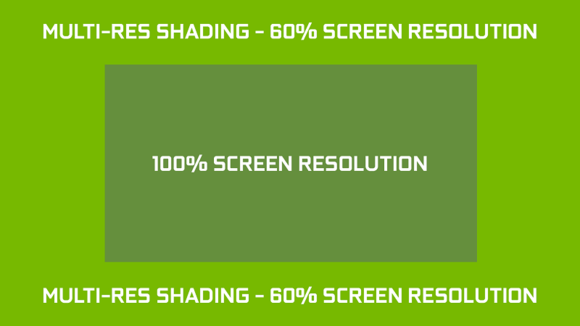 While the center of the screen (you know, where the action happens) renders at full resolution, MRS scales down the resolution around the edges of the screen to greatly reduce the workload placed on your graphics card. My numbers were taken from the forested courtyard in the very beginning of the game. Shadow Warrior 2 allows you to tinker with the multi-res shading setting on the fly. Here’s the exact same scene with MRS set to Conservative. In particular, note the slight loss in quality to the fire in the upper-left corner, and the extra jaggies visible on the foremost lion statue just underneath the torch. You’ll also see more aliasing on the edges of the car in the bottom-left corner. None of this was really noticeable with the game running; I needed to actively seek out the differences in image quality. But get this: The Conservative MRS setting raised frame rates all the way to 82fps to 88fps—a roughly 7.5 percent leap that’s much more noticeable than the slight image degradation at the edges. Finally, here’s the same scene with MRS set to Aggressive. The visual tweaks are much more apparent here, with the aliasing jaggies on the car and lion becoming, well, jaggier, and the torch’s fire degrading into a blob of pixels. Everything in the center still looks perfect, though, and performance once again skyrocketed, all the way to 89fps to 95fps. That’s a huge 14 percent average frame rate difference compared to the performance with multi-res shading disabled. To put that in proper perspective, Nvidia’s GTX 960 is roughly 14 to 20 percent more potent than the lesser-powered GTX 950. 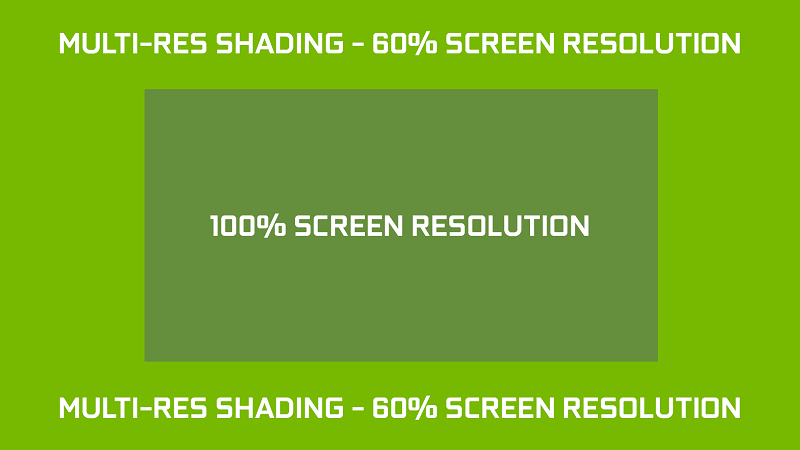 Enabling Nvidia’s Aggressive multi-res shading is like stepping up to a next-level graphics card, for free. That’s if you’re willing to put up with the visual contrast, of course. Sitting still isn’t a very effective way of measuring in-motion visual quality, so I spent some time running laps around Shadow Warrior 2’s introductory courtyard, firing a revolver, and performing double jumps like a madman. While you couldn’t pick out individual jaggies and pixel blobs like in the screenshot above, the Aggressive MRS preset gave the edges of the screen a softer quality, which sort of felt like peering into the game through a slight vignette filter. I wouldn’t call it overly distracting, and I’d bet you’d become used to it after a short time, but the effect is definitely noticeable. You might be willing to put up with it for the performance boost, though. While my laps clocked in at a roughly 85fps average with multi-res shading disabled, enabling Aggressive MRS boosted that all the way to the 100fps mark, with occasional dips into the high 90s. Again: That’s huge. But Conservative MRS is the sweet spot to my eye. Here’s an Nvidia-supplied video of Shadow Warrior 2 running at 4K resolution with Conservative MRS enabled on a GTX 1080. Enabling it doesn’t force the same “soft edge” effect as Aggressive MRS. The screen’s edges still look crisp, especially while you’re in motion, and you’d have to actively seek out flaws to notice the quality change. But Conservative MRS still provides a sizeable boost to performance, raising the average frame rate during my courtyard laps to the low- to mid-90s. That’s enough of a push to help modest cards hit much more acceptable frame rates, or maybe even allow you to push the game’s graphics settings up a notch. Lending credence to that thought, Nvidia’s own performance benchmarks show that enabling Conservative MRS in Shadow Warrior 2 is enough to push the GTX 1060 over 60fps at 1440p resolution, and to allow the beastly GTX 1080 to flirt with 60fps at 4K. Enabling Aggressive MRS pushes the GTX 1080 fully over the hump. Radeon gamers are sure to shriek at the inclusion of this GeForce-proprietary GameWorks tech, but the numbers don’t lie. Nvidia’s multi-resolution shading can unlock meaningful performance gains even if you don’t put the pedal to the metal. I hope Shadow Warrior 2’s MRS inclusion is the start of a beautiful trend, rather than a one-off gift to GeForce owners. And speaking of one-off gifts to GeForce owners, Nvidia wants to push this technology out to the masses. The company’s giving away $50,000 worth of Shadow Warrior 2 game codes (or 1,250 copies) to registered GeForce Experience 3.0 users later this month, following in the footsteps of an earlier promotion that dished out $200,000 worth of Dead by Daylight codes to GFE users. Have an email address handy.